I always find the best pictures on this site! really nice shot :-) love the crop you did here. @Ovidiu, Thanks for your comments. Cropping is always one of the first things I do and one of the most important things! @ovidiu, No problem, hope you find EP inspirational! The best shots are always taken with fixed lenses, like this 135mm fixed. But that also means that you have less flexibility with regards to composition as you cannot zoom in. Fortunately, with the current cameras you have a lot of extra megapixels, so you can take off distracting bits and focus on your subject. The shot above was actually a portrait-oriented shot, but that was quite boring, so I took just this section, which I found more appealing. Nice shot as usually Harry, I love the different tones of green in this one. Nice capture! Lovely image. The colour across the frame, the crop and the vignette all make it a wonderful capture. The story behind "Happy Valentine: blooming cardon cactus in Baja California"
Thought it might be appropriate today to send some flowers.. 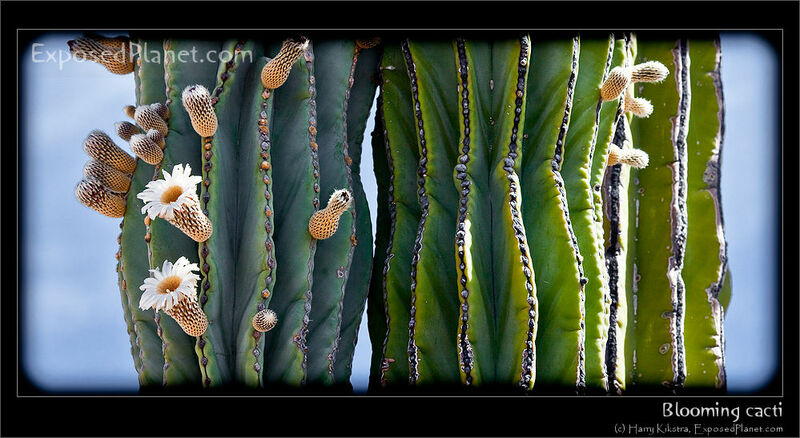 The tall Cardon cactuses on the Mexican Baja California peninsula flower in March-June. The small flowers open up in the afternoon and close in the morning as they are dependent on bats for pollination! Thought it might be appropriate today to send some flowers.. The tall Cardon cactuses on the Mexican Baja California peninsula flower in March-June. The small flowers open up in the afternoon and close in the morning as they are dependent on bats for pollination! Happy Valentine to everybody..